The Ontario Nurses Association and the Canadian Federation of Nurses Unions and its Member Organizations are very pleased to be teaming up to support the work of the Stephen Lewis Foundation with a strong three-year commitment of $135,00 a year for each of three years. The Stephen Lewis Foundation (SLF) works with community-level organizations who are turning the tide of HIV and AIDS in Africa by providing care and support to women, orphaned children, grandmothers and people living with HIV and AIDS. Since 2003, they have funded over 1,400 initiatives, partnering with more than 300 community-based organizations in the 15 African countries hardest hit by the global AIDS epidemic. These grassroots groups are the lifeline for their communities: they provide counselling and education about HIV prevention, care and treatment; distribute food, medication and other necessities; reach the sick and vulnerable through home-based health care; help orphans and vulnerable children access education and work through their grief; and support grandmothers caring for their orphaned grandchildren. The work that will be supported by this investment includes two projects with a particular focus on health care, including health human resources. The first project is the Panzi Hospital Mobile Outreach Clinic and Blood Bank in the Democratic Republic of Congo (DRC). This clinic facilitates the safe collection of blood donations, and blood screening to ensure adequate supply of safe blood at the Hospital where it is much needed. Among the surgeries performed at the hospital, a common surgery requiring blood products is fistula repair. Fistulas are often caused by multiple rapes which are used as a weapon of war in the DRC. The second project that will receive support is the Swaziland Nurses Association for their mobile clinic. Through their Swaziland Wellness Centre, the Nurses Association has provided health and wellness services to more than 10,000 health care workers. Health care workers are often unable to seek care during working hours, and the mobile clinic allows them and their families to be seen quickly and easily in their home communities and workplaces. Since the very beginning, SLF has relied on the support of Canada’s labour movement. From funding special initiatives to general unrestricted funds, the support, solidarity and commitment of our movement has had, and continues to have a profound impact on communities across sub-Saharan Africa. 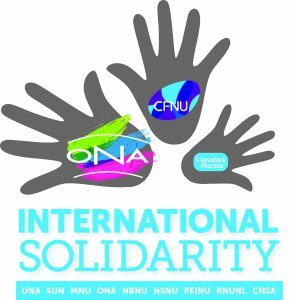 The CFNU and ONA are proud to continue this tradition of solidarity with the Stephen Lewis Foundation and are particularly pleased to be able to direct our support to our sisters and brothers in the health care sector, who are working tirelessly under very difficult circumstances to turn the tide of HIV & AIDS, an epidemic which continues to disproportionately impact women and girls.